Blue Wing™ is a concentrated spray pattern indicator dye used for clearly marking the application of pesticides, herbicides, fertilizers and other sprayable solutions where application efficiency is required. Blue Wing™ leaves a vibrant, visible and non-permanent blue color to natural or manmade surfaces. Shake well before use. Product usage may vary upon required color per application. For best results, first use Blue Wing™ at manufacturers recommended application rates. Apply Blue Wing™ to actively filling vessel prior to the addition of active ingredients used in applications. 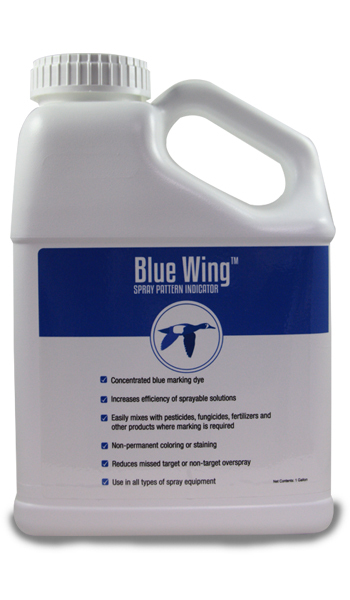 Agitation will fully disperse Blue Wing™ throughout the entire sprayable solution. Apply straight from container. Add 12 – 16 ounces of Blue Wing™ Spray Pattern Indicator to every 100 gallons of total sprayable solution. If darker color is required, add 4 more ounces at a time, allow for full agitation of solution. Check coloring and add more if desired. Keep out of the reach of children. It is recommended that rubber gloves and eye protection be worn when handling of this product. If product is ingested, contact a medical professional. Product can cause non- permanent staining. Product can be safely removed with soapy water or a diluted mixture of bleach.